Who rescued who? This special 5x7 double black table frame celebrates finding each other! 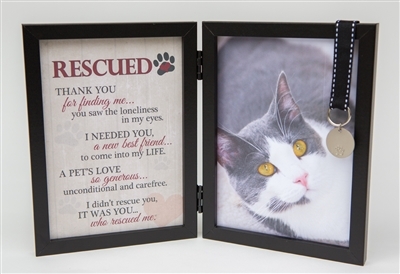 Our new cat frame features a space for a 5x7 photo of a beloved rescued cat. A black/white stitched ribbon holds a silver engravable disc with a pawprint stamp. The disc can be left as a cherished accent, replaced with the cat's tag or engraved.